Three branches of the Whitewater River converge in a spectacular geological gorge formed during the last ice age. The gorge provides miles of hiking trails with scenic vistas, picnic areas, vertical cliffs and the beauty of Thistlethwaite Falls. As the last Ice Age drew to a close and the Wisconsin glaciers began melting back from the Wayne County area eighteen to twenty thousand years ago, one huge lobe of ice lingered in the valley of the East Fork of the Whitewater River. Geologists tell us this vast mound of ice produced a raging flood of water as it melted over a period of years. The flood was so powerful in summer that along one of its paths it cut a narrow channel scores of feet deep into the ancient bedrock. Today that channel is known as the Whitewater River Gorge. In the course of many thousands of years, the Gorge was partially refilled with sand, gravel, and clay washed into it by the river. Great forests grew up on the land released from the grip of the glaciers. Groups belonging to the obscure Eastern Woodland Societies lived near the Whitewater River from around 7000 B.C. to 700 A.D. and probably used the Gorge as a hunting and fishing ground as did the modern Indians after them. White pioneers, impressed by the rugged beauty of the Gorge, its fertile soil, abundant timber, building stone, and flowing springs, began settling east of the River in 1806. Many of the first settlers were members of the Society of Friends from North Carolina, searching for a new home in a land not blighted by slavery. Many German immigrants, reaching the Whitewater Valley via Cincinnati, also settled in Richmond early in the nineteenth century. Because of the main stream of pioneers flowed from the east and the Gorge was a significant obstacle in their path, all of early Richmond lay east of the Gorge. Even today more of the city lies east of the Gorge than West. At first the Whitewater Gorge was essential to Richmond's growth as a source of water power and raw materials, and later, as a site for important industries. But technology spawned new sources of energy, new materials, and new industries, and the Gorge was left behind by a city rushing toward the future. Development of the Whitewater Gorge Park has helped restore the Gorge to a place of honor in the heart of Richmond and preserve the beauty of the Gorge for future generations. 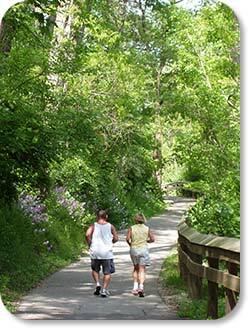 Visitors to the park may bike or walk along a paved trail that extends from Veteran's Park to Test Road. The Starr-Gennett Walk of Fame medalions recognize music pioneers who recorded historic music in this valley. Whitewater Gorge Park is part of the Richmond Parks and Recreations system. Material excerpted from the Whitewater Park Trail Guide distributed by the Richmond Parks and Recreations department.